Faried was everywhere, finishing breaks, catching lobs, grabbing boards, blocking shots and drawing charges, until the Rockets knocked off the Toronto Raptors, 121-119, Friday at Toyota Center. 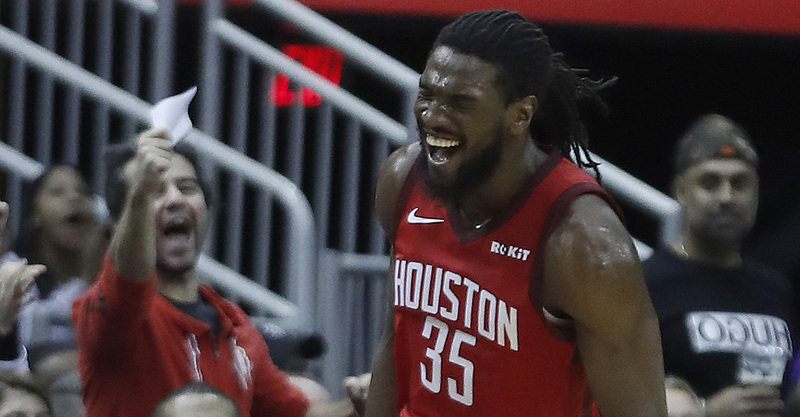 But Faried was the difference, scoring 21 points with 14 rebounds and providing energy plays that allowed the Rockets to build a lead just large enough to hold on. The Rockets led by 14 with less than three minutes remaining, before they proceeded to collapse through a meltdown as spectacular as against the Nets or Knicks. Harden turned the ball over and Gordon missed a 3 he forced up when he thought he was fouled, leaving the Raptors within two with time to shoot for the win. They got the looks they wanted, especially after a pair of Harden drives and a slick bounce pass to Faried on the break put the Rockets up 18. The Rockets had rolled through one of their best first-half stretches of the season, not only building a lead that reached 22 points, but doing it with contributions from nearly everyone that took the floor.